Chinatown's 10Below ice cream parlor has had a two-hour-long line since it opened a year ago. That's because it's doing ice cream unlike anyone else in New York. Owners Richard Tam, Wilson Tam, and David Chen got the idea for the rolled, not-scooped ice cream after watching a viral video of rolled ice cream being made in Thailand, and the lines (and Instagrams) followed. 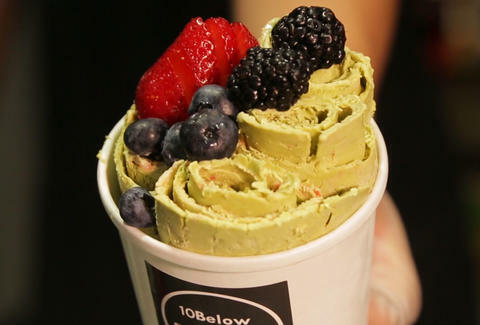 Some of 10Below's most popular flavors are Monkey Business (banana and Nutella), Cookie Monster (made with Oreos), I Love You a Latte (coffee and chocolate chips), S'mores Galore, and Matcha Made In Heaven (green tea and blueberry). Check out the video below to see what goes down in the shop, and prepare yourself to fall into a hypnotic state of ice cream happiness.